After a long and snowy (!) 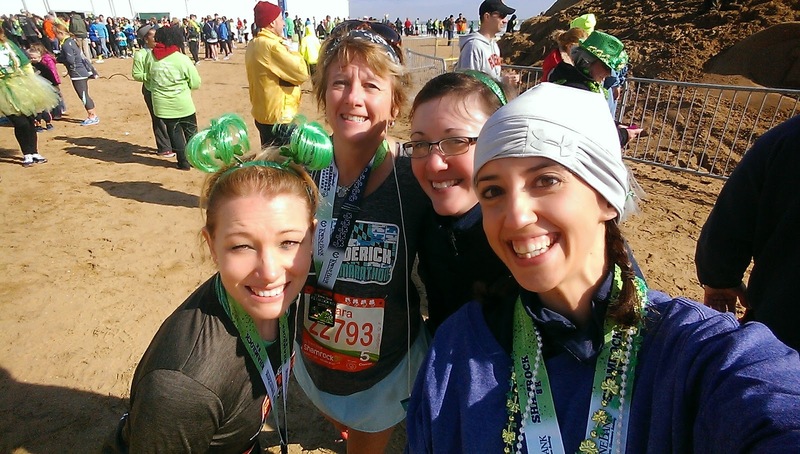 drive from Pennsylvania, Jen and I finally arrived in Virginia Beach, VA for the 43rd annual Shamrock Marathon Weekend! Jen went to the hotel to check in and I headed straight for my shift at the J&A Racing booth. As an ambassador, one of my duties is working the expo and helping to answer questions about the weekend and other J&A events. As usual, the expo was amazing- lots of cool vendors and lots of space to move around. 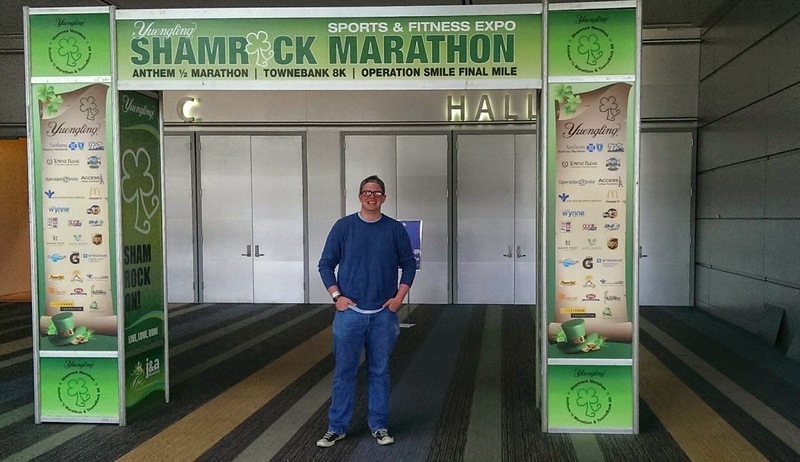 One thing I love about Shamrock is that they check your ID at the expo- no need to carry it on race day to get your four complimentary post-race beers! Once my shift was over, and Jen and I got all our bibs, shirts, and packets for the weekend races, we headed to dinner with some of my friends that live in Norfolk and Hampton Roads. It was a great way to unwind from a long day. But we couldn't stay out too long- the 8k started at 7:45! Lots of free stuff at the J&A booth. The next morning, Jen and I were up and out the door by 5:45 am. 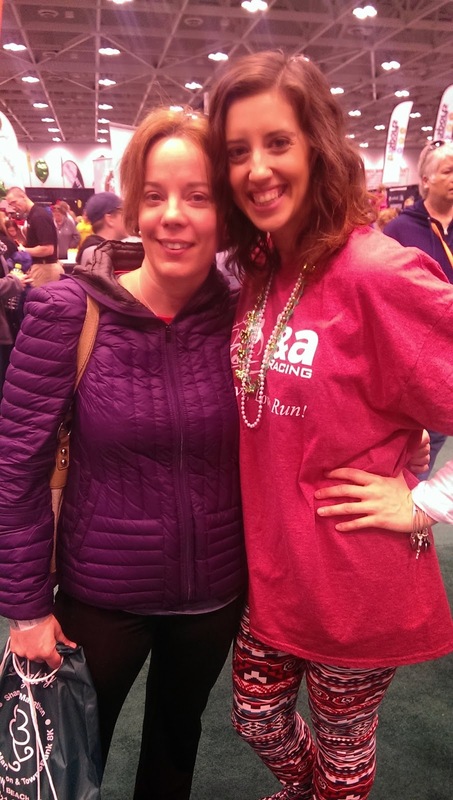 Since I was running, Jen decided to volunteer at the finish line handing out medals. We parked at the Convention Center (about 20 blocks from the start/finish line) and took the volunteer shuttle up to the start. 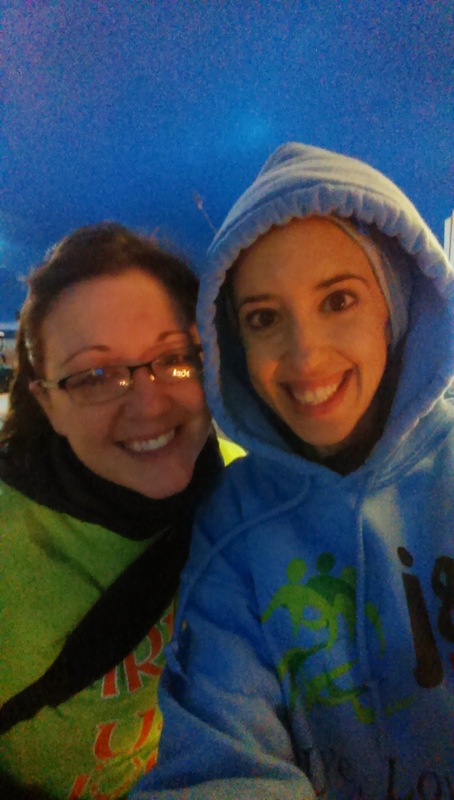 Jen headed off to her volunteer duties while I found a hotel lobby to keep warm in- it was 38 degrees! Jen and me reenacting scenes from Frozen. While waiting for the race to start, I got to see my friend Sid Busch- he's run 198 marathons and almost 500 half marathons! 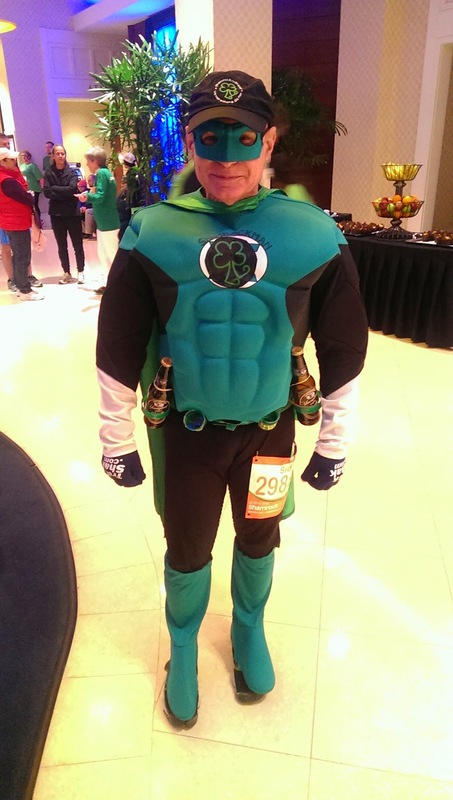 This race, he was running as "Shamrock Man" with two beer bottles in his holster :-) It was nice to catch up with him. Around 7:20, I headed over to bag check to drop off my sweatshirt and meet a fellow ambassador to give him his bib- his flights had been cancelled and delayed and he didn't get into VA Beach until midnight the night before. With all my errands out of the way, I made my way to corral 12. 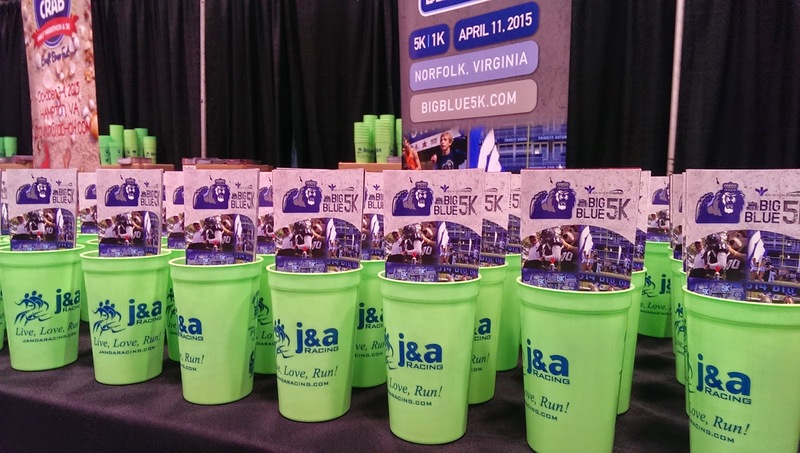 There were approximately 10,000 people running the 8k and there were 16 corrals. 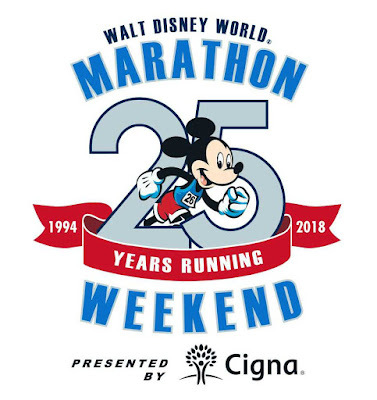 I was placed into 12 due to my expected finish time- I finished last year's race in 1:01:41. It took about 35 minutes for our corral to get to the start line which wouldn't have been as bad had it not been so cold and windy! 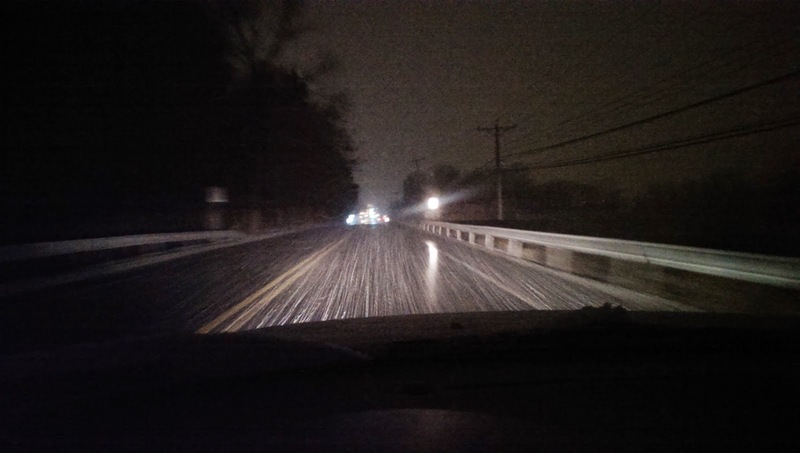 I was wearing a singlet, arm warmers, a jacket, a long sleeved shirt, capris, knee-high compression socks, gloves, and a hat. And I was still chilly! At long last, it was corral 12's turn! Knowing I was running the half the next day, my strategy for this race was simple- just finish. I wanted to run a good race and feel strong and fast at the finish. I had set up my timer for 1:1 and felt really good when we started. This race is pancake-flat. Like super awesome flat. It's a simple two miles south, turn around, two miles north on the boardwalk, then a quick little out and back and then finish on the boardwalk. An 8k is 4.97 miles. I checked my watch at mile 1- 11:13- way, way too fast! I tried to slow down a bit and just enjoy the chilly run. I had planned on throwing away the long-sleeved shirt I had on but I never really got warm enough to part with it. I did take it off around mile three but then put it back on after the race. Right around mile four, I realized that if I kept the pace I was running, I would hit a major PR for this distance. It was the best feeling. 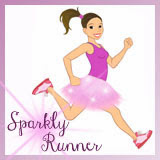 Since my stress fracture this fall, all of my runs have been easy- I haven't pushed the pace for fear of re-injuring my foot. But during this race, I pushed. And I ran hard. And I crossed that finish line at 57:29, a full four minutes off my time from 2014. Medals are delicious in the morning. What could be better than a PR? Getting your medal from a friend! Jen was still on medal duty so she put this glittery new medal around my neck. I headed into the party tent to grab my free beer and ran into Kathryn and Kathleen. I met both of these lovely ladies through twitter and Disney- it was great to catch up with them and chat about the race! Jen met up with me later and we ran into two friends from work- Sara and Steph. After chatting for a while, we started the mile walk back to the car- I had another expo shift at 1:30. Kathleen, me, and Kathryn. Thanks to Preston (Kathryn's husband) for this picture! Steph, Sara, Jen, and me. Beach selfies for the win. I love this race for a lot of reasons but here's my top three: 1. It's an unusual and challenging distance. Not a 5k, but not quite a 10k. 2. Beautiful medals! 3. Flat, flat, flat course. Excellent for trying for a PR. 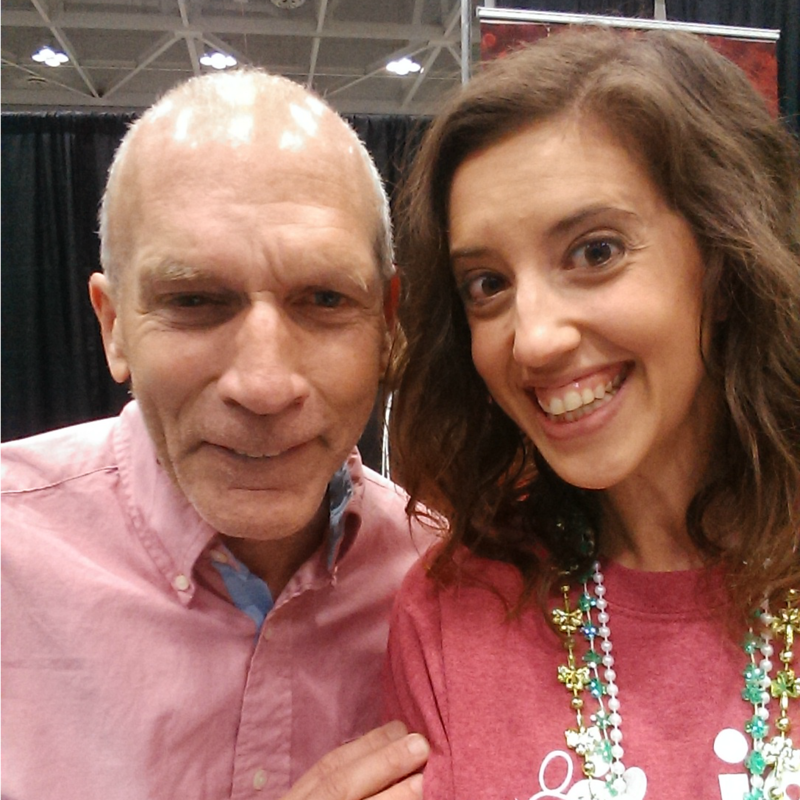 My expo shift that afternoon went really well- I got to chat with Bart Yasso and take a #Bartie, we built pyramids with J&A cups, and I got to talk to SO many people about running. It was awesome. And, my brother arrived from NJ! And several other friends came by the booth to chat- including some co-workers that I worked with 10+ years ago! Pretty dang cool. Jason and Derek being creative master minds. He absolutely didn't want this picture. But I made him. That's what big sisters do. 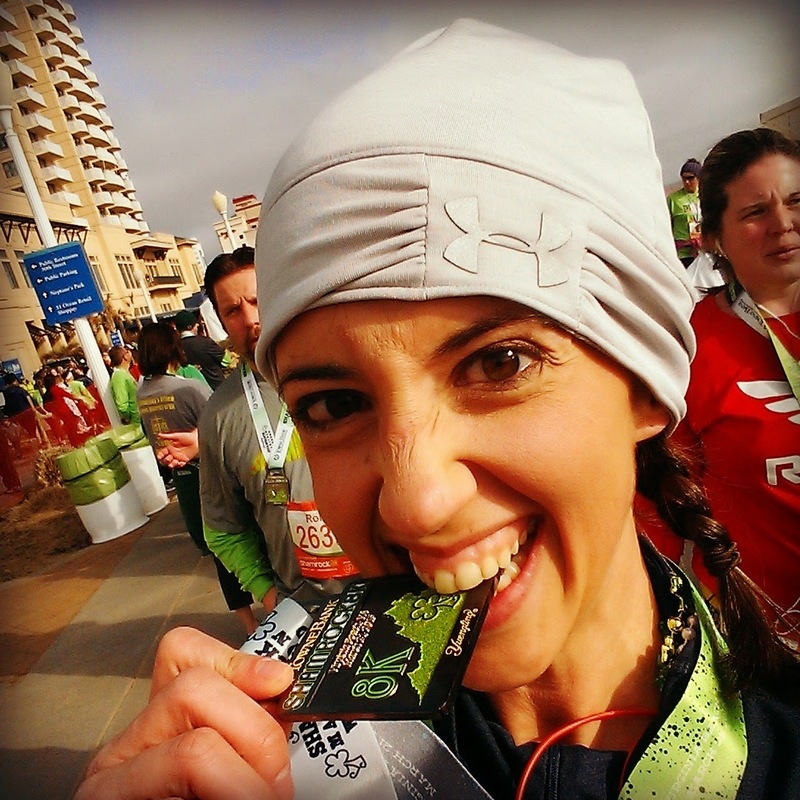 Have you ever ran an 8k or another unusual race distance? 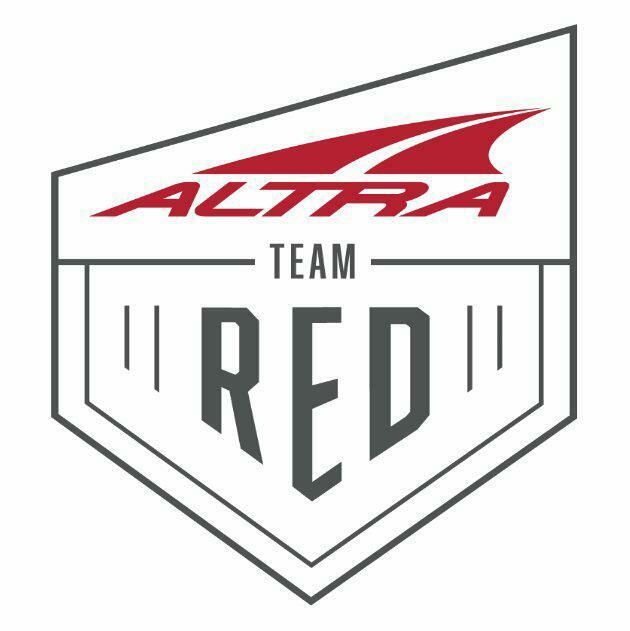 Disclosure: As a J&A Ambassador, I received a complimentary race entry. As always, all opinions are my own. 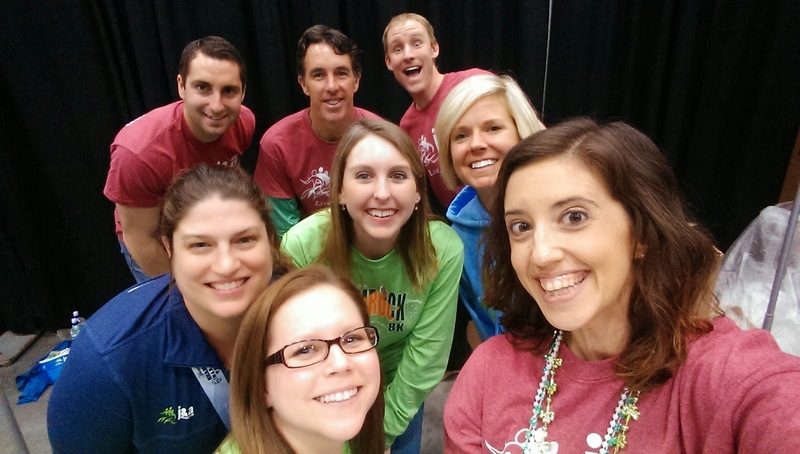 Interested in more Shamrock Weekend fun? 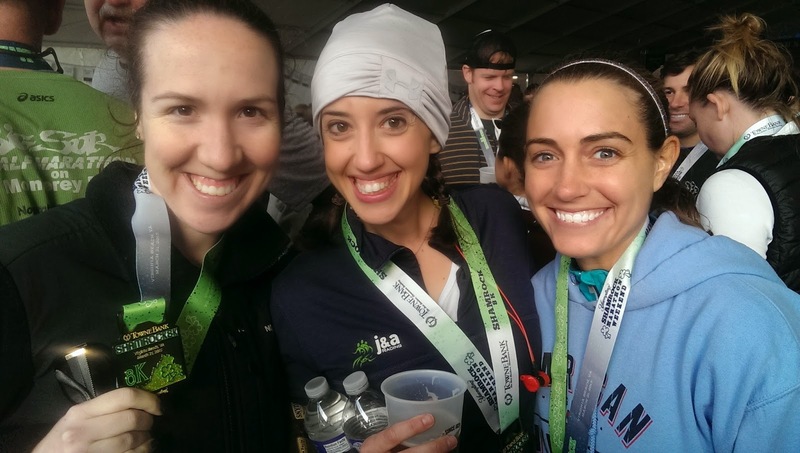 Check out the 2015 Shamrock Race Recap linkup below, hosted by J&A Ambassadors Nan, Sarah, Lindsey, and Jennifer. 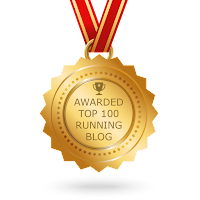 Link back to the blog host(s) in your recap so your readers can find the list. Love reading recaps? Here is a one stop shop for some Shamrock goodness! Note: This linkup will be open until April 22, 2015. Thanks, Christine! I am still trying to find the balance of pushing myself and giving my body the time it needs to heal/be healthy. It was awesome to see you last weekend too! Congrats again on your amazing PR! I know you were frustrated for so long with your injury and your recovery, but what a way to kick the injury in the booty! Congrats!!! So happy to read about you running again and killing it! 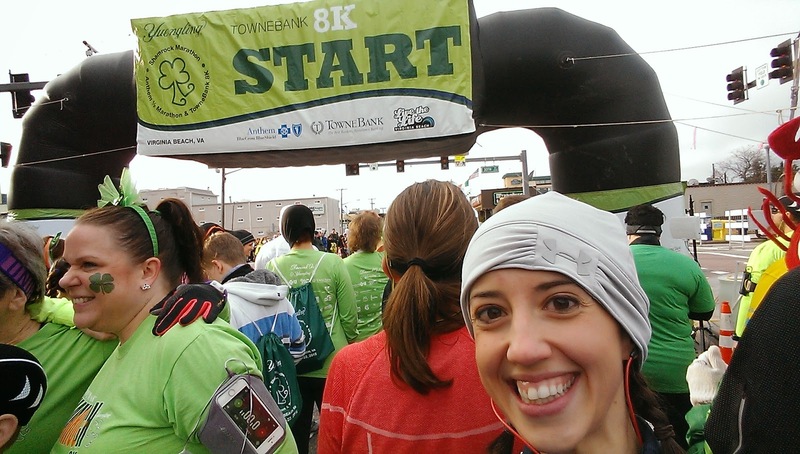 In answer to your question, I ran an 8k in Baltimore last November and I really enjoyed It! The Zoo Zoom. I totally agree about the distance. I loved it! Congrats on that awesome PR! Shamrock seems like an incredible race weekend, definitely on my race bucket list. 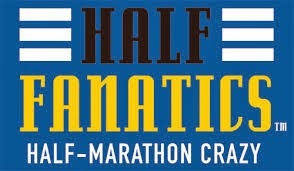 Can't wait to read your half race recap! YES! So nice to meet you in person! I hope we are racing together again soon! Congrats on a great race! I love J and A races and can't wait to go back and do another one! Thank you! 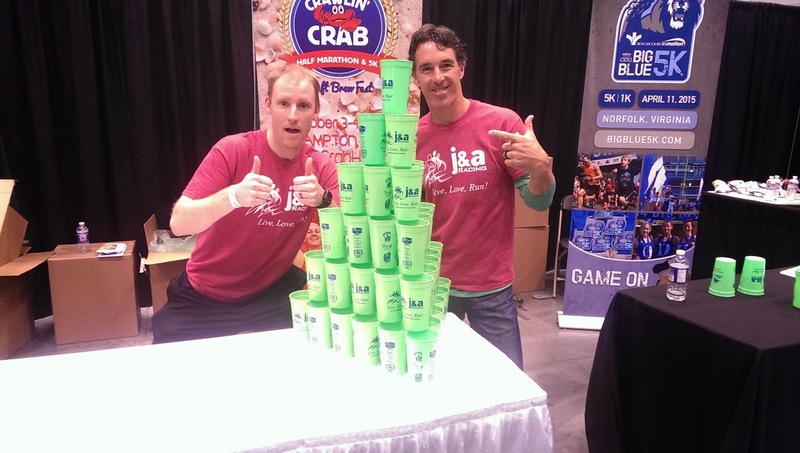 I am already looking forward to Crawlin Crab and 2016 Shamrock! It was so great meeting you and I LOVED my little pre race goodie bag you made me! Congrats on your PR! Awww, I'm so glad you liked it! They were fun to make! It was great to meet you too. I hope we get to race together again soon!